Back at home, I did some Googling, and I think what we saw was a late-’50s era GAZ Volga “Shark”. 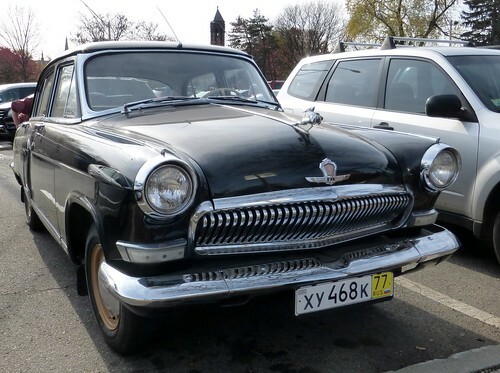 “GAZ” stands for Gorkovsky Avtomobilny Zavod, or Gorky Automobile Plant, and this Volga is apparently a late enough model to feature the toothy vertical grille that debuted in 1958, but early enough to still feature the iconic leaping-deer hood ornament, which was phased out in 1961. I don’t know much about cars, but I know enough to gawk and take pictures when a relic from Cold War Russia pulls up and parks in the neighborhood. This is my Day Nine contribution to NaBloPoMo, or National Blog Posting Month, a commitment to post every day during the month of November: thirty days, thirty posts. 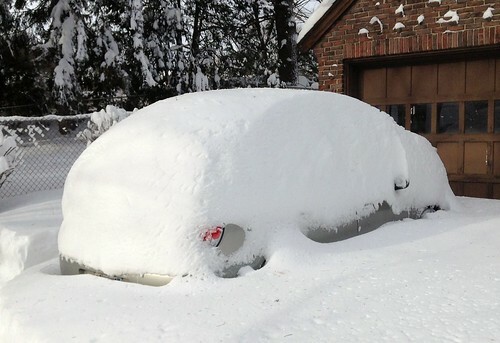 In the past when I’ve had to dig out my car from a massive snowstorm, a broom has done the trick: just sweep away the bulk of accumulation, then use a snow-scraper to remove the rest. (That’s what I did in this post from eons ago, when I lived on my own in New Hampshire and Reggie was still alive and young.) When you’re removing two feet of snow, however, a broom just doesn’t cut it. 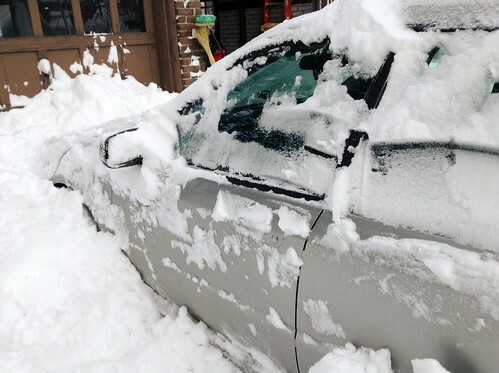 Yesterday I tried a regular broom then a push-broom to remove a few inches of snow from my car before settling on a compact plastic shovel, one I’d bought years ago to keep in my car for emergencies. 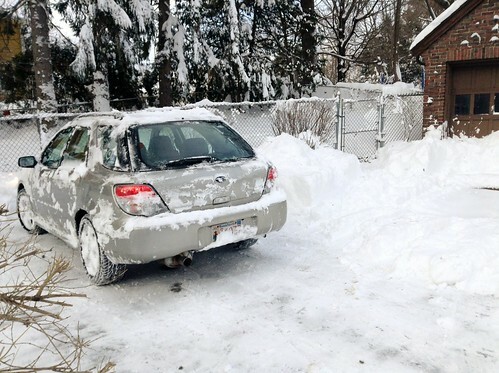 Luckily, that shovel now lives in the garage, so I was able to use it on the snow-pile where my car had previously been. 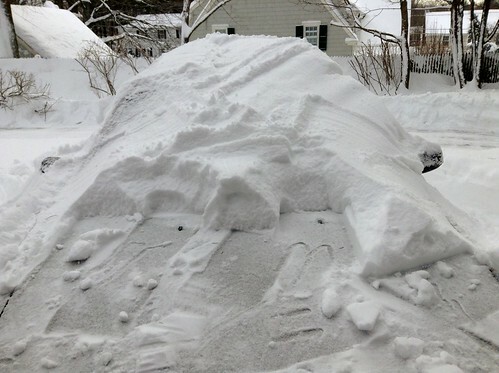 When you’re shoveling out a buried car, you aren’t trying to create something pretty. Instead, you’re aiming to uncover the rough contours of the vehicle: here a tail-light, there a door. 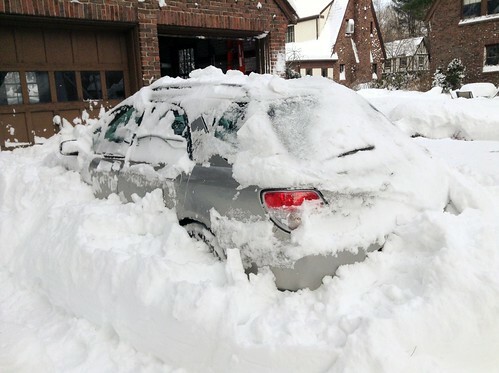 Once you’ve uncovered enough of the hood, grille, and tailpipe to make it safe to start your engine, you can concentrate on digging out the driver’s side door. Why? 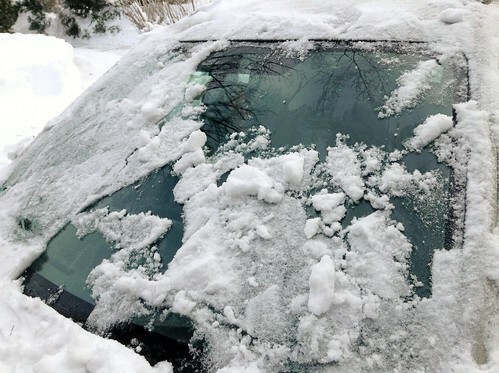 Once you’ve turned the car on, you can run the heater at full blast through the vents, melting the windshield from within. 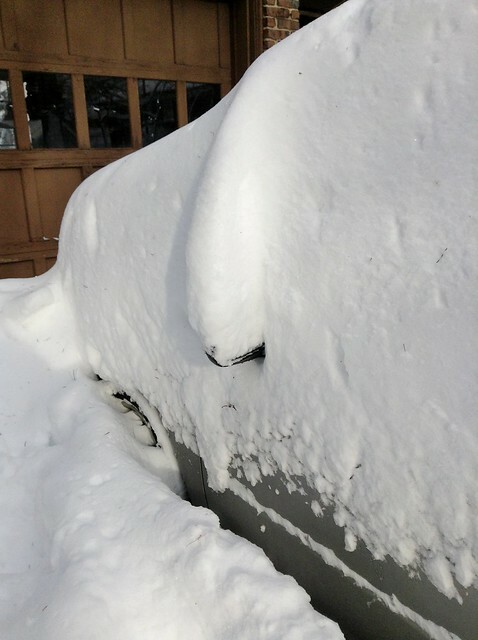 Once you’ve cleared most of the snow from the roof, hood, and windows, you can move your mostly-clean car into a spot where you know it will eventually be sunny. If you carve out the rough outlines, the sun will do the rest. 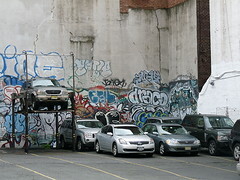 In response to today’s Photo Friday theme, Cars, here’s an image from my archives, from a day-trip to New York J and I took in October, 2009. Classes at Keene State started this week, so I spent a lot of time in my car this commuting between Newton and Keene…and for the first time in the 10 years I’ve taught at KSC, I actually parked on campus rather than walking from a nearby apartment. Keene State doesn’t stack ‘n’ pack commuters’ cars, but maybe they should, given how a free parking space can be a precious commodity on a bustling campus. 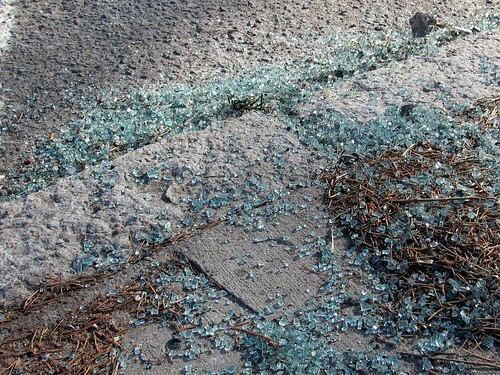 Sparkling in diamond-sharp light, the detritus of someone else’s car crash crunches underfoot, shining shards of safety smashed. This is my Day Five submission to a river of stones, a month-long challenge to notice (and record) just one thing every day. I’ll be posting my “stones” both here and on Twitter, where submissions are tagged as #aros. Care to join us at any time during the month of January? Click here for more information. Enjoy! It’s been a few years since I posted a picture of a dog patiently waiting for his owner outside the local laundromat, during which time, several stuffed dogs have done their own stints as Laundromat Dogs. 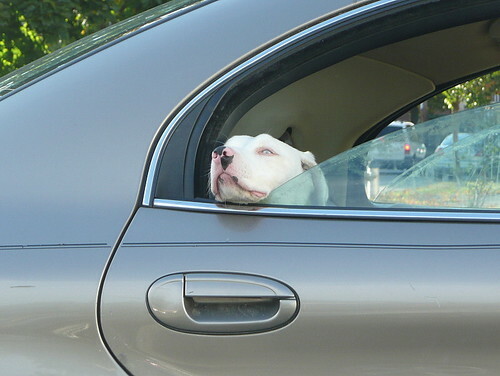 Here’s the latest dog to serve as car-guardian outside the local laundromat. Judging from his expression, this isn’t the first time he’s been left to lounge while his owner washed and dried a few loads. Given the fact that I have both a Flickr tag and blog category devoted to cars and trucks, it took me a while to decide what photo to post for today’s Photo Friday theme, Vehicle. With so many options to choose from, I’m faced with an embarrassment of riches. 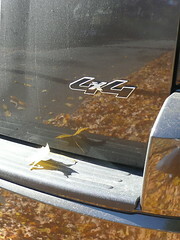 Rather than recycle an old joke, I decided to share two never-before-blogged photos from earlier this month, both of which feature the leaf-on-vehicle motif. 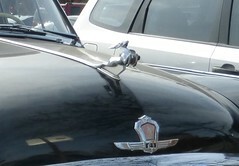 Cars can be shiny status symbols, but they are also ubiquitous, an essential part of the visual backdrop of our lives. Walking down an ordinary street, only automotive aficionados notice parked cars, and then only if those cars are noteworthy collectibles. But our cars say a lot about our selves, considering the amount of time some of us spend in them. They bear our bumper stickers, carry our toys both cute and creepy, and sometimes end up junked in our yards. 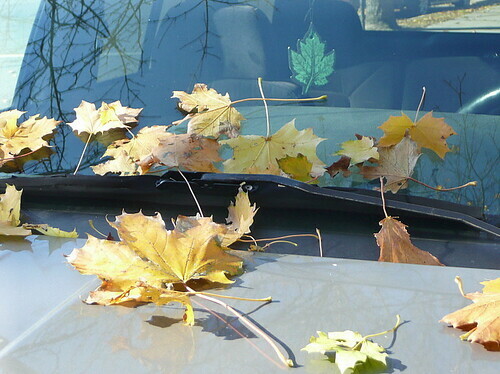 An image of a windshield covered in fallen leaves or a back bumper reflecting a row of raked ones transports to a place called “autumn” just as surely as a set of wheels can. This is my contribution for today’s Photo Friday theme, Vehicle. 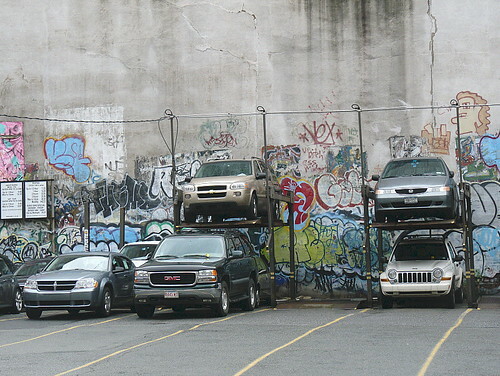 Leave it to a parking lot in SoHo to figure out the best way to pack as many cars (and graffiti) into a small space as possible. J and I took a whirlwind day-trip to Manhattan on Saturday, arriving by train at Penn Station just in time to walk to SoHo, check out Greg Lauren‘s latest art show, grab lunch in Little Italy, and then walk back for our return train. Although we were in Manhattan for only about five intermittently rainy hours, we each took hundreds of pictures, New York being the kind of place where you can completely submerge yourself in sensory stimulation. Even in five hours–only about 300 New York minutes–you can absorb a month’s worth of color, movement, and shape: sights to savor on a quiet day. I’ll have more photos to share, along with impressions of Greg Lauren’s show, later in the week. In the meantime, I have several stacks of papers (and the usual schedule of classes) between me and a Tuesday night grading deadline. I’ll see you on the other side, after I’ve (metaphorically) unpacked.